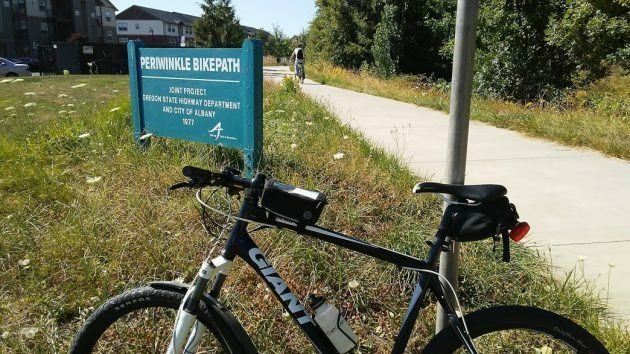 Refurbished sign marks the Periwinkle Bike Path entrance on Queen Avenue. Over 40 years or so, wind and weather had left their mark on the sign marking one entrance to Albany’s first bikeway. Now the sign looks like new again — because it is. You can see that it was in pretty bad shape. I had not been through that way lately, but this week I noticed the sign had a brand-new look. I asked Parks and Recreation Director Ed Hodney who deserved the credit for this upgrade and when it was done. “Park Maintenance took care of the Periwinkle sign,” he replied, “with help from Extreme Grafix on the lettering.” And the work was done last month. 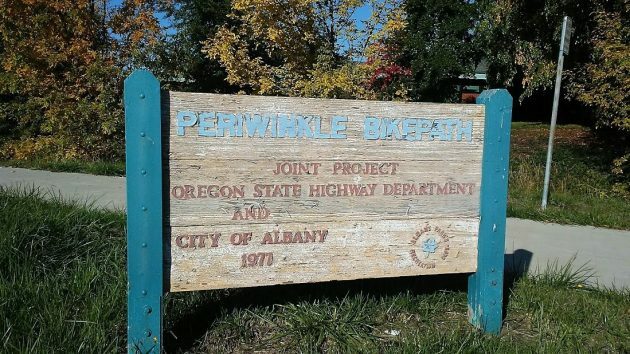 As the sign reminds us, the city and the Oregon State Highway Department together got this path built in 1977. It’s 1.7 miles long and runs beside the channelized creek from Ninth Avenue near Lowe’s to Grand Prairie Road and Grand Prairie Park, passing a couple of other parks on the way. The only snag is at Queen Avenue and Geary Street, where there’s no clear way to get across the intersection on a bike. You can get off the bike and walk to pick up the path on the other side, but that kind of defeats the idea. Something new besides a sign for us here in “A-town”, so called hub city. We sent “men” to the moon 49 years ago. All it takes is desire, time, $$ and associated resources. But what it really needs is a circuit. That is a continuous loop with two starting points. One at each end with parking lots. Yeah! Drawing us from two starting points. WE COULD HAVE SO MUCH BETTER! ….but we are stuck in this stupid MAGA con, bitching about local guvmint and the local ARA. I should leave it at the stupid MAGA CON …. it is what it is. Refreshing to see the new sign to replace one of Dave Clark’s previous projects. And also the upgrade to Sunrise Park is appreciated. Now if the “Welcome to Albany” sign in North Albany gets replaced, Albany will have a reason to feel welcomed. It is in sad shape.